Abstract: fiberglass cable protection tube is a kind of pipe which is made of resin, continuous glass fiber and its fabric as reinforcing material, and is formed by computer controlled winding process or pulling process. (1) Good corrosion resistance. The FRP Pipe channel can resist acidic, alkaline fluids and non-fluid erosion. Under normal circumstances, the service life of steel pipes is 15 years, cast iron pipes are 5 -- 10 years, and FRP Pipe can be used for 50 years. (2) Anti-fouling and anti-moth. The surface of the pipeline of unsaturated polyresin is clean and smooth, and its special medium will not be contaminated with biological decay such as fungi. For example, steel pipes, cast iron or reinforced concrete pipelines, the surface is easily attached to microorganisms and difficult to remove, resulting in increased roughness. Rate, reduce over-water section. The FRP Pipe Road does not produce microorganisms under light avoidance conditions, so it is free of pollution and is clean for a long time. (3) Good heat resistance and cold resistance. Can be used for a long period of time within the range of -- 40 °C -80 °C. If a special formula is used, the resin can work at temperatures above 110 °C. (4) The engineering life is long, safe and reliable. Pipes are durable and have a safety factor of 6 or more. Its pipeline life can be as long as 50 -- 100 years. For example, the water supply pipeline built from Shenzhen to Hong Kong on the Hong Kong side is 50KM long, which is two FRP Pipe roads with an internal diameter of 2.2 M and 1.7 M, respectively. It has been installed and used since 1965. (5) Light weight, high strength, convenient transportation and installation. 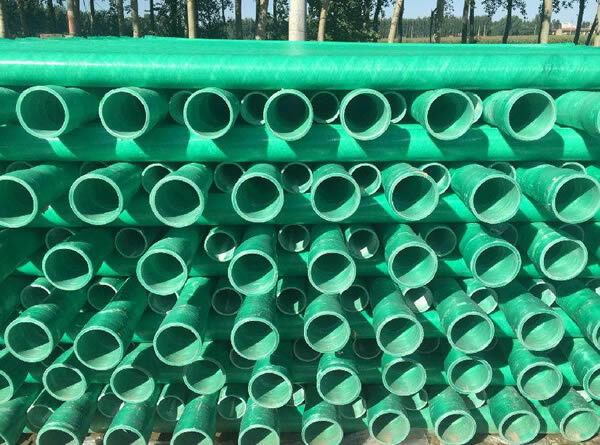 The specific gravity of the FRP Pipe channel is about 1.8, the ring tensile strength of the pipeline is 100 -- 200 Mpa(close to the steel pipe), and the axial tensile strength is 320 Mpa. The effective length of each FRP Pipe road can reach 12m, which can reduce two-thirds of the joints compared to concrete pipes. Single and double sealed plug-in connection, installation is fast and simple, construction period can be shortened by 1/3 than steel pipes, cast iron pipes, concrete pipes, and the installation of steel pipes for the need to avoid cumbersome processes such as welding and rust prevention. (6) Small resistance and high transport capacity. The inner surface of the glass pipe is very smooth, with a rough rate(0.0084) and low friction resistance(much less than the roughness of steel pipes and cast iron pipes). The Hasenweilian coefficient C used in the calculation of hydraulics can be maintained in the range of 145 -- 150 for a long period of time, and the coefficient of flow resistance loss F measured is 0.000915. Compared with concrete tubes(f = 0.00232) and steel pipes(f = 0.00179), the fluid pressure loss along the process can be significantly reduced and the conveying capacity can be increased by more than 20 %. Therefore, in the same capacity, the project can choose the glass pipe with a smaller internal diameter, thus reducing the one-time project investment; If an equal inner diameter pipeline is used, the FRP Pipe channel can reduce the pressure loss compared to other material pipes, that is, save the power and energy of the pump(about 30 % -- 40 %) and reduce the long-term operating costs. (7) Good electrical and thermal insulation. Fiberglass is an insulator, and the electrical insulation performance of the pipeline is excellent. It is best used in transmission lines, dense areas of telecommunications lines, and multiple mined areas. The heat transfer coefficient of FRP is very small(0.25 kcal / M? Huh? °C), the thermal insulation of the pipeline is good. Good wear resistance. The water containing a large amount of mud and sand was put into the pipeline to carry out a comparative test of the impact of rotation wear. After 3 million rotations, the wear degree of the inner wall of the pipeline was detected as follows: the steel pipe coated with tar and enamel was 0.53 mm; Steel pipe coated with epoxy resin and tar is 0.52 mm; The surface hardened steel pipe is 0.48 mm; FRP Pipe is 0.21 mm. This shows that it is quite wearable. Engineering maintenance is simple and economical. 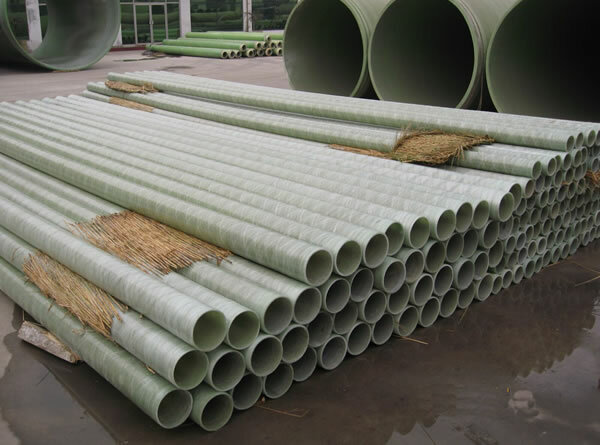 Due to the above-mentioned corrosion resistance, wear resistance, Frost resistance, and pollution resistance, the FRP Pipe Road does not require anti-rust, anti-fouling, and insulation measures. There is no need to protect the ground tube, which can save more than 70 % of the project maintenance costs. Unexpected damage can also be easily repaired. E: The shape of the product can be designed to meet specific shape requirements. F: Pipe stiffness can be designed to meet different load requirements. Prev : What are the causes of corrosion in FRP Pipe?